Ryan Blaney and the No. 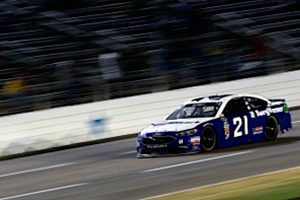 21 BorgWarner crew had a fast Ford Fusion throughout Sunday’s rain-delayed Texas AAA 500 at Texas Motor Speedway and came home 12th in the rain-shortened event. Blaney started eighth and ran around the top 10 – and as high as fifth place – for most of the race. The BorgWarner Ford Fusion was at its best on long runs, and Blaney also was able to find speed by running the top lane. He was running in the 10th position when rain brought out the caution flag with 46 laps left to run. Crew chief Jeremy Bullins called Blaney to pit road for fresh tires, which cost him a couple of spots but could have put him in position to contend for the win had the rain held off. But the rain continued, and the race was called at that point, leaving the BorgWarner team with its 14th finish of 12th or better this season. Team co-owner Eddie Wood said he had no problem with the decision to pit for fresh tires despite the chance the race would not be restarted. “That’s the way you win races,” he said. Wood added that he was proud to see his team perform so well in its first race with BorgWarner on board. “Ryan did a great job,” Wood said. “The car was fast all night, and the pit crew had another outstanding race. Wood also said he was honored to have nine guests from BorgWarner and Ford Motor Company on the team’s pit box and with the team through a long day and night at the track. The No. 21 Wood Brothers Fusion will return to the track this weekend at Phoenix International Raceway where it will carry the colors of SKF for the second time this season.